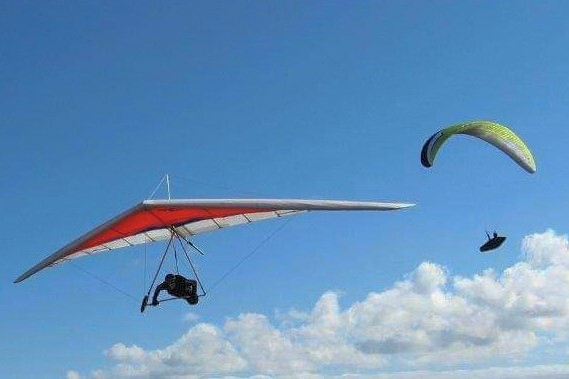 Flying gliders is probably one of the most rewarding things you will ever undertake. From your introductory and further lessons with an instructor, those tentative first solo flights (only when you’re ready) and beyond to longer soaring adventures. 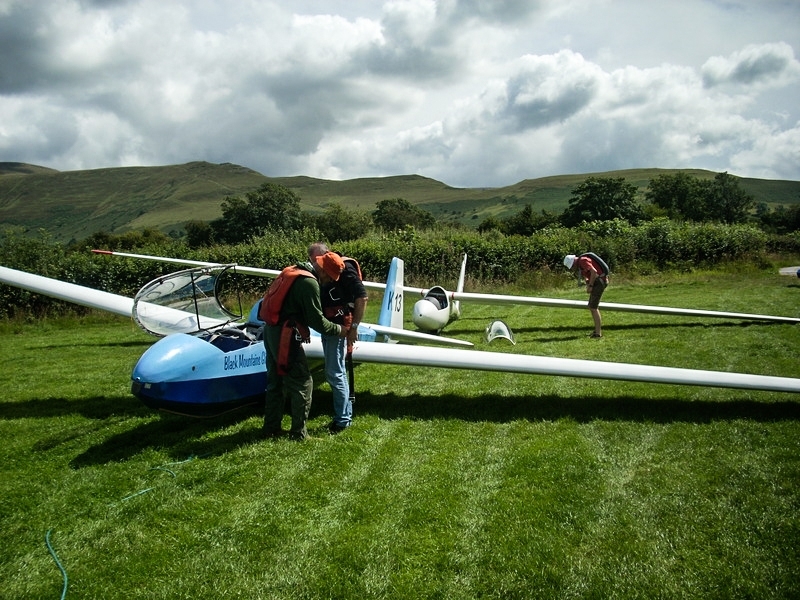 At every stage there are fantastic experiences, the sensation of flying in near silence, the breath-taking views of the Brecon Beacons National park, and climbing thousands of feet on rising currents of warm air, often in the company of birds of prey. Combine this with the highly-dynamic character of flying these amazing aircraft it’s no surprise that people quickly get grabbed by this intoxicating sport. Just about anybody can learn how to fly a glider. Some will learn faster than others. But if you’re of normal fitness, less than say 16 stone and old enough to accept tuition then you can fly a glider. Young people can start at a surprisingly early age, minimum weight is more of an issue so this probably means a lower age limit of around 12/13. It’s actually permissible for young pilots as young as 14 to fly solo in the UK. Many people take up gliding relatively late in life, some returning after tasting gliding when younger, perhaps in the Air Cadets or Scouts! 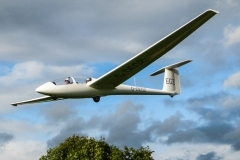 Firstly, glider flight training is free to members. Most of the people you’ll be involved with when learning to fly will be volunteers. Including most of our instructors who are highly qualified British Gliding Association (BGA) rated and subject to regular competency checks. BMGC is a BGA affiliated glider school. 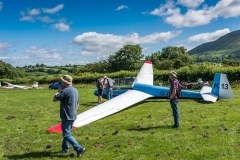 You will need to pay an annual membership although a Gliding Experience/Trial Glider Lesson gives you three months free membership – a great way to start. 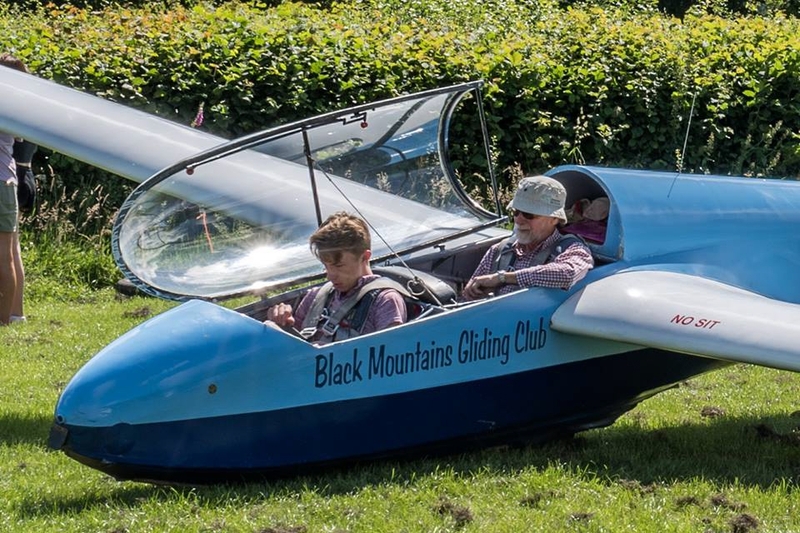 Black Mountains Gliding Club operates all year round while many ‘flat land’ clubs practically close down in Winter months. We operate seven days per week for 8 months of the year. We revert to weekend operations from November to February. But if the conditions are looking good we will be flying on weekdays, organised at short notice using our online forum. Also, Over the last ten years we have averaged 185 flying days per year! And average flight times of 1:10 per launch! 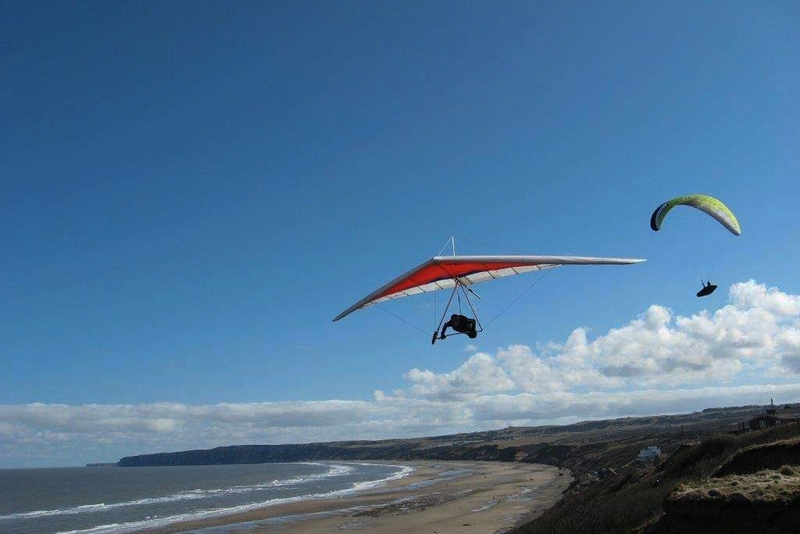 At BMGC we only launch our two seat training gliders using the aerotow method. A powered plane tows the glider into the air. 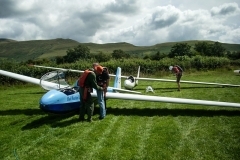 The glider releases and the job of the instructor is to find rising air in order for the aircraft to remain airborne, often for hours, although your lessons are probably going to be around 50/60mins. The tow-plane takes the glider to where the pilot/instructor asks to go. Alternatively, the tow plane pilot takes the glider to a place where he is quite sure there is good lift. This means the glider pilot can be confident of a head start for a long soaring flight. We have many options to give the student pilot and instructor time in the air and the conditions to make rapid progress. We have long mountain ridges that provide reliable and predictable lift in most wind directions. The varied terrain produces good thermal conditions, and, in the autumn/winter, we experience a rare phenomenon called ‘mountain wave’ which gives us smooth lift over large areas, often to amazing heights. By the time you are ready for your first solo, you will be able to act as pilot in command, undertake pre-flight inspections, handle aircraft correctly on the ground, take off, land and be able to fly the glider efficiently, gaining height in thermals, and soaring local ridges. At this point your airtime will be greater than most gliding locations because of the local terrain coupled with the aero-tow launch. And you’ll have a good number of flights under your belt and in most conditions. The duration of our training flights means you get more time to practice than many locations that might predominantly use winch launching. But were not Easyjet, and need people to be patient, accommodating and to generally to help out at launch. You’ll need to attend a pre-flight briefing too. 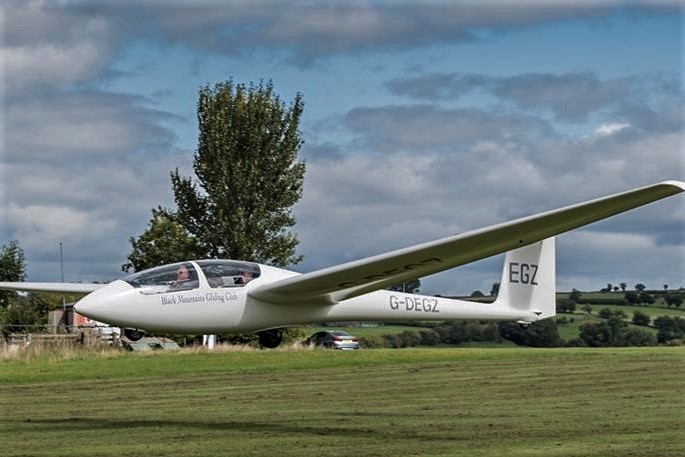 But unlike in the past, and at some other gliding clubs, you’re not expected to hang around all day. We recognise that people have other work/life pressures on their time. And we like to keep student pilots motivated. The costs of gliding are lower than most people expect. All tuition is free to members. We pay per launch based on the height of the aerotow – approximately £30. The only other cost is to cover general maintenance of the glider which works out at around £20 per hour. Plus we have a soaring scheme for that can reduce costs – a fixed price for unlimited glider usage. A nobrainer for anyone that thinks they will fly more than 20/30 times in a year. So flying costs can work out at around £45 per glider lesson. That’s with an instructor! Once solo, you will be flying for longer and the cost per hour will decrease – so a 2.5 hour flight in a club single seater (K6) might be a total of £60 or £24 per hour. Like all sports you can throw huge amounts of money at gliding. But most pilots will fly club gliders or share a glider with a friend. And second-hand gliders hardly depreciate. It is difficult to provide an exact cost to solo, factors like weather and pilot aptitude play a major part. However, providing you put the time and effort in, you may expect to be solo after 40-50 flights. 2-3 launches a day is possible on a course. If you have previous flying experience you can be solo after significantly fewer flights. Joining the soaring scheme is normally a good move. The soaring scheme is a prepayment of club glider hire charges for 12 months. You can then fly as many hours as you wish with no further hire charges. Well even the experts are still learning. But the time to get to flying solo is up to you to a large extent. Younger people learn faster and people with any other aviation experience can also progress rapidly. Someone progressing well might solo after 30/40 flights. So flying weekly, possibly with a few more intensive weekends, or a full week thrown in, will see that person solo in their first season, they will have become confident in ridge soaring, and will be improving their thermaling skills. Alternatively, If you only manage a glider lesson a couple of times per month you will make slower progress and it might take a year or more.